Here's a quick write up of Sailing The Solent about my RYA Competent Crew course. I'm very relieved that I didn't get sun burnt and we had great weather over the five days of the course. 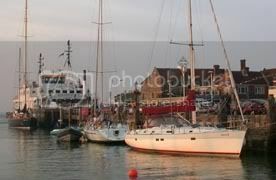 The picture is of our 42ft yacht moored in Yarmouth. There's a few more pictures in the article. Over all, I had a great time and I'm convinced sailing is fun enough that I hope to eventually earn my Day Skipper qualification.